Listening to: "The Dim and the Dark," Jump, Little Children. How I've worn the sweater before: here, here. So your responses to my last post were actually pretty surprising -- I was thinking that I was going to get some "Yeah, maybe you should have done something different," comments -- and instead, you all seemed to like the cream&white color combo and the mix of textures! Thanks for all your kind and supportive feedback, it's inspiring me to be even more playful with my daily combinations! I can't believe I've never posted this outfit before, because this might be my go-to outfit. I wear it at least once a week. I like the mix of patterns, and the floral skirt and dark tights make me feel slightly grunge. The necklace is made of real shells and I've had it for a few years now. 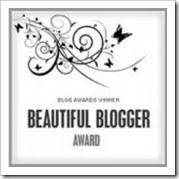 We were recently tagged by Betz of her armoire for the Beautiful Blogger award! Thanks, Betz! And now I have to share 7 random things about myself...Nikki can post about her random things in her next entry. 1) I am still scared of the dark. I think when I was little I watched way too many horror movies (Nightmare on Elm Street, It) and never really got over my fear. I have to have at least the window blinds open or the computer monitor on. 2) I was born in the Philippines and lived there until I was 2. Because our dad was in the military, I've also lived in Alaska, Hawaii (for about a month) and California. After he left the military, we lived in Alabama and Georgia. 3) I love old movies and some of my faves include "It Happened One Night" and "Singin' in the Rain." 4) I I majored in journalism and psychology for my undergraduate work. 5) I once put Sun-In in my hair thinking it would give me light highlights. It turned the top of my hair orange. 6) I hoard certain things. I collect penguin stuff, Phantom of the Opera ornaments and old movie posters. 7) My favorite flavor of ice cream is peppermint. And now we get to tag 7 lovely ladies. Great pattern mix, the work so well together! Hi neighbor! I see that we both live in Atlanta. I love the mix of floral and stripes here. Very chic! I love Betz...she is too cute. And congratulations on your award. It is always fun to learn more about each other. Thanks for visiting my blog and leaving such a nice comment. Come back any time! I love the pattern combination - what a fantastic go-to outfit! That necklace is gorgeous. Love your seven random things - I never used Sun-In, but what a horrible experience you had with it! I LOVE how you've done the stripes and floral trend! I may have to try this! i adore this striped top on you joann! :) and congrats on your award. love your random facts. i have yet to try peppermint ice cream! I'm still in awe of the French Connection dress from your last post... so pretty! And Candis and I thank you so much for the tag! Yay for pattern mixing! I'm still not ready to committ to the mixing... so I just do it with scarves next to patterned tops when I wear one. I love how this look turned out with the coat - chic! Oh! And a blog award awaits you on Athenista. Thanks for providing some Over the Top posts and always including a little something extra, whether it be silly or sentimental. Love your posts! congrats on the award! well deserved, especially with this cute outfit! Cute outfit! Love the trench and the boots! And congratulations on the award! I'm still scared of the dark too... I have a Maxfield Parrish nightlight. Beautiful outfit, sweetie! 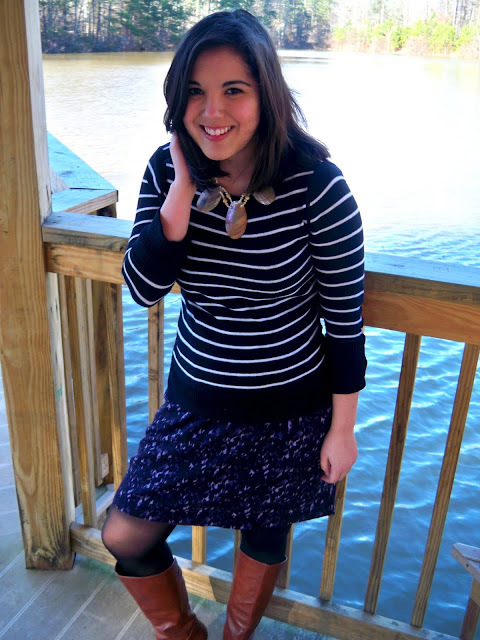 I love that sweater with the skirt and boots...and your necklace is gorgeous! Love the mixed print and that classic trench! Great to go outfit! I like how you styled everything together on this outfit! IT also make me think that I need to get myself some floral pattern pieces! They are such a good item for pattern mixing!